For as long as I can remember, exercise has been a huge part of who I am. I don’t really remember a time that I wasn’t active, playing a sport, regularly going to the gym, or in someway moving my body on a daily basis. I’ve always been about the same size, give or take a few pounds, but never going more than just a few days without any exercise. So when I found out I was pregnant last year, (per my doc’s approval) I continued to teach my regular 12 classes/week at Zengo as long as it felt okay. I was entering into unchartered unfamiliar territory for myself, which made me excited/nervous, BUT, my ultimate goal was just to keep moving daily, even if it was occasionally at a snail’s pace. Honoring my body allowed me to teach until I was 37 weeks pregnant! Throughout my pregnancy, everyone kept saying “oh, you’ll bounce back to your body in no time!” and “you’re so active, that baby weight is going to just melt right off of you.” I had no idea what I was in for, but knowing how active I was and how sure those women sounded, I totally believed them! Unfortunately, that was not the case for me. Let me tell you, having a baby was the most humbling experience of my life thus far. Not only did I grow a beautiful baby girl, I birthed a beautiful baby girl, I fed a beautiful baby girl, gave up my precious sleep for a beautiful baby girl, but it was the first time in as long as I could remember that I had taken 6 weeks off from any exercise in my life. (I actually did a Crossfit class the day before I went into labor!) I was so excited to start working out again that I went straight from my doctors appointment where I got approval to exercise again, to Melissa’s 12pm class in the Kentlands. Fun fact, I almost died during the SECOND song. Seriously I remember thinking “I don’t know if I can do this.” I walked out of the studio that day with my face the color of a tomato. It was HARD, but I felt sooo good! I was so high; I couldn’t wait to go back. As I got back into the swing of things and started teaching again, I was sure the rest of my baby weight would come off. Full disclosure, I gained 40 lbs during my pregnancy. A big chunk of it came off almost immediately, but at this point (about 3 months postpartum) I was still hanging on to quite a bit of weight. But like everyone said, it was “totally going to melt right off!” so I didn’t panic. I picked up a few classes and tried to add some running into the mix wherever I could fit it in. I was also breast-feeding, so I was sure that would do the trick. While I was feeling stronger and a little bit more like myself with each passing day, the number on the scale just wasn’t going anywhere. I went to the doctor for an annual checkup in May and was told I was still 18 lbs over my pre pregnancy weight. Honestly, I had a mild meltdown. 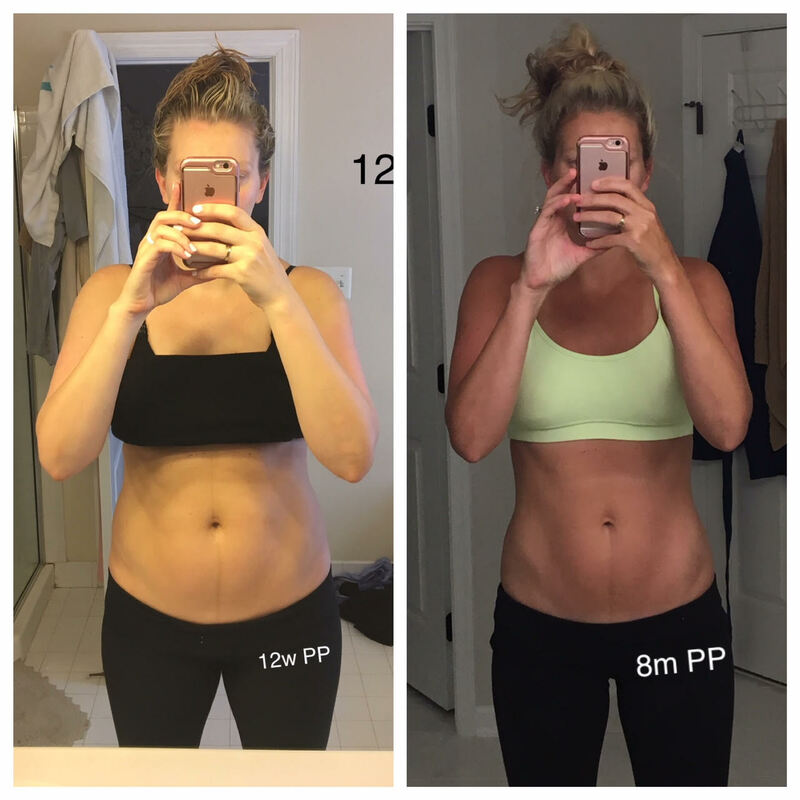 I was 4 months postpartum and had only lost half the weight?!? What was I doing wrong? Being that my career consists of me up on a podium showcased in front of (up to) 40 people at a time, I felt like the pressure was on and all eyes were on me to see how quickly I would bounce back to my old self. In my head, all the riders were just staring at my body and judging the weight I was still holding onto. I was putting a lot of pressure on myself. That day I committed to making a change. I started to track what I was eating a little more closely. I made a few small changes here and there to begin. 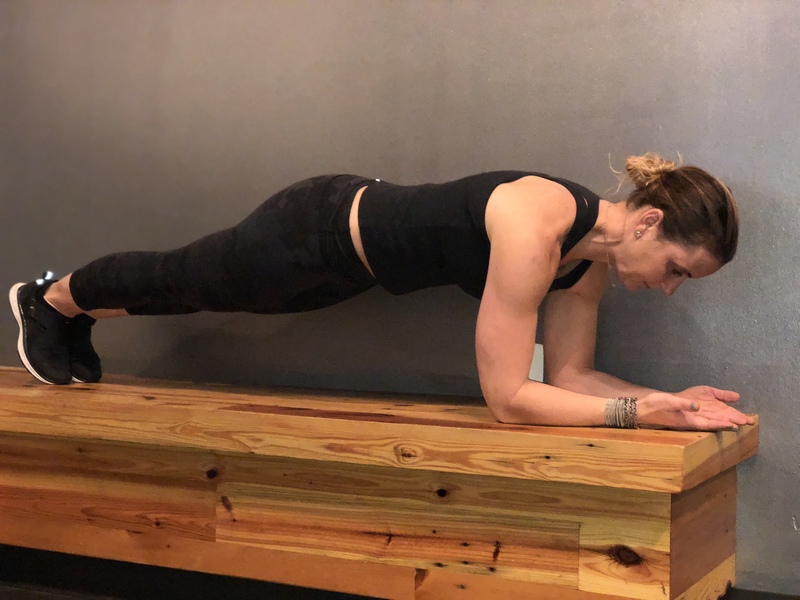 Once I began to log everything I was putting in my body, I learned that while I was eating healthy up until that point, I was eating a LOT more than I needed. I began to document my food intake in the MyFitnessPal app and FINALLY the weight started to melt off. What I hoped would take me 3 months to do, took me 7. It took a bit longer than I had imagined it would to lose all the weight, but by 7 months postpartum I was back down to my pre-pregnancy weight, and by 8 months I weighed LESS than my pre-pregnancy weight. I don’t necessarily look the same as I did pre baby (don’t have nearly the amount of muscle I used to), but I’m okay with that. Don’t get me wrong, I love a glass of wine and something sweet at the end of the day. I didn’t follow any diet plan, or really restrict myself from eating anything that I really wanted. But I did learn to hold myself accountable and to really get in tune with my body, often asking myself if I was really hungry, and practicing portion control. I am back to finally feeling like my old self again. This journey has been amazing, and crazy, and humbling, and exhausting, and emotional. But I have learned so much about my body and myself and I am forever grateful for it. Be patient. Rome wasn’t built in a day. You spend 9 months growing the most perfect human being ever, give yourself the physical and mental time to recover from that (slightly traumatic) experience. Your body DOES have muscle memory. You will be able to fit into your pre-pregnancy clothes again. When you’re ready, commit. Sign up for a class and go. Once you get cleared to exercise again, get your husband, a sitter, a friend, a partner, whoever to babysit and GO. It won’t be easy. Actually, it might be hard AF to start, but your body is going to remember how good exercise makes you feel. Put one foot in front of the other and just make progress. Baby steps. Set small goals. The big picture can be super daunting and stressful sometimes. Set little goals for yourself every week. Write them down. It can be anything from going to two fitness classes one week, to going for a walk every day, to making your lunches this week instead of eating out. Whatever they are for you, write them down and cross them off when you accomplish them. The small victories add up to big successes! Grab a buddy! Sweating is more fun when you sweat together. Grab a friend and go to a class, or even just go for a walk. Not only do you need to release those endorphins, you need time with your bestie too. Fit it in when you can! Sometimes that means 6am Zengo Cycle class before the babe wakes up, or sometimes it means for 20 minutes in your basement when your little one is taking their morning nap. It doesn’t have to be much at all. Take care of YOU! Prioritize yourself. This is often the hardest piece of the puzzle now that you have a baby, but the MOST important. You are a better person and mom when you are taken care of. For me, exercise has a whole new meaning. After having a baby, I like to exercise because it makes me HAPPY more than anything. I am a happier, more pleasant person when I have gotten my sweat in. But some days I just don’t have it in me, and that’s okay! Listen to your body. If its asking for a break, take it. Take a bath, pour a glass of wine, watch Netflix. Whatever it is that makes you happy that day, do it.